Biju Thomas, OCA, OCP, is a senior database administrator with more than 15 years of Oracle application development and database management experience. He has coauthored five Oracle certification books published by Sybex and has written articles for multiple Oracle technical publications. Part I: Oracle Database 11g: SQL Fundamentals I. 1. Basic SQL SELECT Statements. 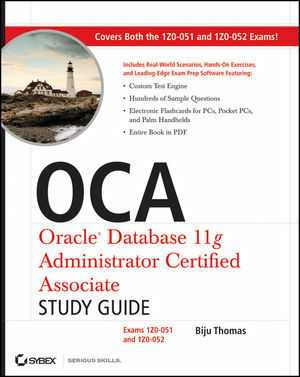 Part II: Oracle Database 11g: Administration I. 8. Oracle Database 11g Components and Architecture. 9. Create an Oracle11g Database. 10. Database Storage and Schema Objects. 13. Managing Data and Undo. 14. Proactive Maintenance and Performance Monitoring. 17. EM Tools and Data Utilities. The name of the table is FIRED EMPLOYEES, so each instance of FIRED EMPLOYEE in the INSERT statements should read FIRED EMPLOYEES. In addition, the four INSERT statements are missing close parentheses at the end. Each INSERT statement should end with "...TRUNC(SYSDATE))"
"ATAN2(n1,n2) is equivalent to ATAN(n1/n2)." "ATAN2(n1,n2) is equivalent to ATAN(n1/n2) if n1 and n2 are positive integers." "BITAND(n1, n2) takes two arguments, where n1 and n2 are positive integers or zero." 93 Text correction: Error under "SYSTIMESTAMP"
Delete "takes no arguments" from the first sentence. "The SYSTIMESTAMP function accepts an optional parameter to specify the precision of seconds value. The precision argument can be between 0 and 9, the default is 6." "Which SQL statement will replace..."
The correct answer is D, not A and D as given. "Unlike views or stored SQL, synonyms don't become invalid if the objects they point to are dropped." ?Whenever a user performs a transaction in the database, the information needed to reproduce this transaction in the event of a database failure and the user does not get a confirmation of the COMMIT until the transaction is successfully written to the redo log files.? The second sentence in the first paragraph after the query, "Once redo log group 3 is full, LGWR switches to redo log group 4."